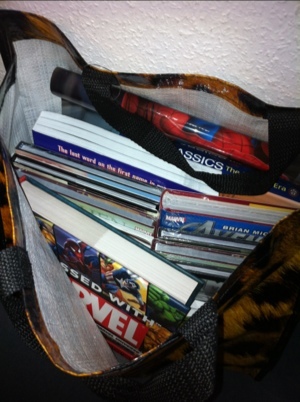 How many graphic novels can you fit in motorbike panniers? As well as being a scifi nerd scifi hubby is also a very keen motorcyclist so we are currently away for a few days on the motorbike. In fact I’m being a human satnav. Scifi hubby is going away without me for the first time ever – however he would have got lost getting there so I played ‘satnav’ and am now spending a couple of days by the seaside with him before flying home. I then get three weeks without him and he enjoys riding around on the motorbike.